Daidalos Team Discussions on the Official 1C Company Forum - contains information on the development of the latest updates. 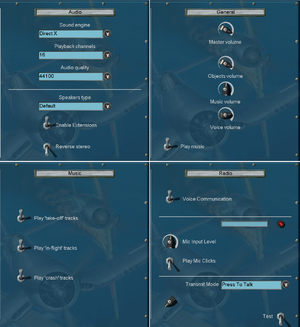 Mission4Today - one of the best IL-2 resources for mods, skins, campaigns, guides, updates and fixes. SAS' Updates Thread - thread containing links to latest update packs. Intro cutscene can be disabled in game's launcher. 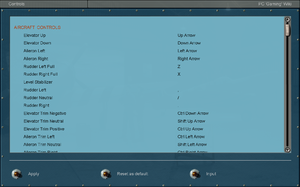 Option is located in lower, left corner of a launcher. Latest version is 4.13. If you want to update follow this guide. Added with 4.13.4 update on April 5, 2018. Native support since 4.12.2 (fullscreen modes). See Widescreen resolution for older solution. Widescreen hack should work too. Keys for changing FOV can be set in Input settings. In-game setting is very weak. 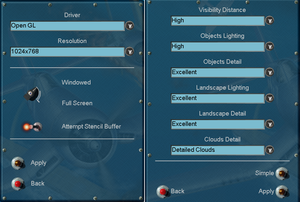 Can be improved through graphics card control panel. 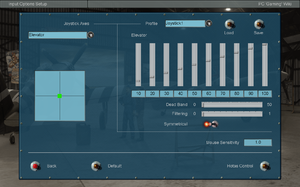 Anti-aliasing can be forced in graphics card control panel. Enabled by default. Cannot be disabled. 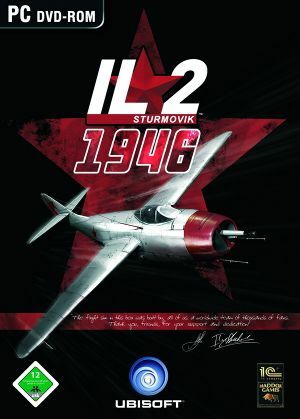 Go to a folder where you've installed IL-2 Sturmovik: 1946 and edit conf.ini with a text editor. Find a line width= and change it, entering width of a screen (e.g. width=1920). Find a line height= and change it, entering height of a screen (e.g. height=1080). Find a line SaveAspect= and make sure it's set to 0 (SaveAspect=0). Find a line ChangeScreenRes= and make sure it's set to 1 (ChangeScreenRes=1). Find a line EnableResize= and make sure it's set to 0 (EnableResize=0). Save a file and launch a game. Main menu is still rendered in a latterbox mode. Changing settings in-game or in game's launcher will make the game run in 4:3, again. Fix implemented on patch 4.12.2. Mouse is only used for menu navigation. For XInput controllers see Controller#Force feedback driver for XInputXInput force feedback vibration in DirectInput games. ↑ 2.0 2.1 File/folder structure within this directory reflects the path(s) listed for Windows and/or Steam game data (use Wine regedit to access Windows registry paths). Games with Steam Cloud support may store data in ~/.steam/steam/userdata/<user-id>/15320/ in addition to or instead of this directory. The app ID (15320) may differ in some cases. Treat backslashes as forward slashes. See the glossary page for details.